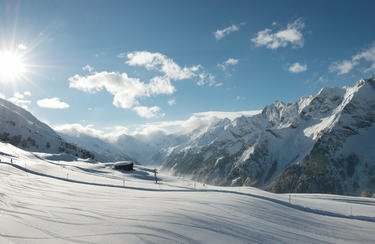 Outdoor athletes and nature-lovers can draw from plentiful resources during a winter holiday in the Zillertal: It is necessary to discover the spectacular runs, endless trails and sunny cross-country skiing routes. In order to indulge in body and soul into winter sports, you just need the proper equipment. This is available at INTERSPORT Bründl, center Mayrhofen. Winter sports fans can also enjoy all the INTERSPORT Rent services, next to a wide selection of modern equipment for sale or rent, in the ski rental in Mayrhofen. One of the most tempting offers: Hire ski or snowboard equipment for seven days and only pay for six. Are you interested in additional services that make your winter vacation even more beautiful? The INTERSPORT Rent team will be happy to help. Families feel completely comfortable in the idyllic Zillertal. In order to ensure that your holiday not only runs smoothly, but also safe and inexpensive, give a visit to INTERSPORT Bründl, center Mayrhofen: Take advantage of the INTERSPORT Rent discounts on rental equipment for children and youngsters. Also helmets and protectors are a must for safety on the slopes and can be rented cheaply in your ski rental in Mayrhofen. Fantastic service. Thank you very much. ausgesprochen freundlich u kompetent. Weiter so. Ich war mit der Beratung und der Freundlichkeit des Personals sehr zufrieden !! Nochmals vielen Dank ! !